It should feel like autumn no? It was 90+ degrees and humid outside this past week. And my son came home from school recess looking a little like a sweaty tomato. My favorite season is fall. I love the way it smells, the way it sounds, and the way nature gets ready to tuck itself in for slumber. Acorns, felt fabrics, flannel sheets, apple pie, fresh pressed cider, and new knitting projects all signal to me days growing shorter, and nights cooler. I do however, have issue with pumpkin guts. I just can't get past the smell and the slime. But that bright orange smooth skin and funny green twisty stem, has me crafting these guys in a different way. More to come on that. But open one up? Not near me please. Wonderful fall paper craft! Recycle those paper bags. From A Place For Us. 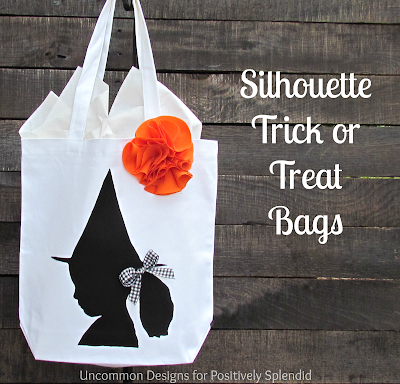 Witch-y silhouette Trick or Treat bag tutorial...from Positively Splendid. This one is so inspiring! Can't wait to be a part of her next project. 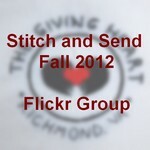 Congratulations on such a successful event! From Bits of Splendor...Project Hope. Needed this read after a tough morning with my daughter...for the moms Choosing to Take Beauty from I Take Joy.